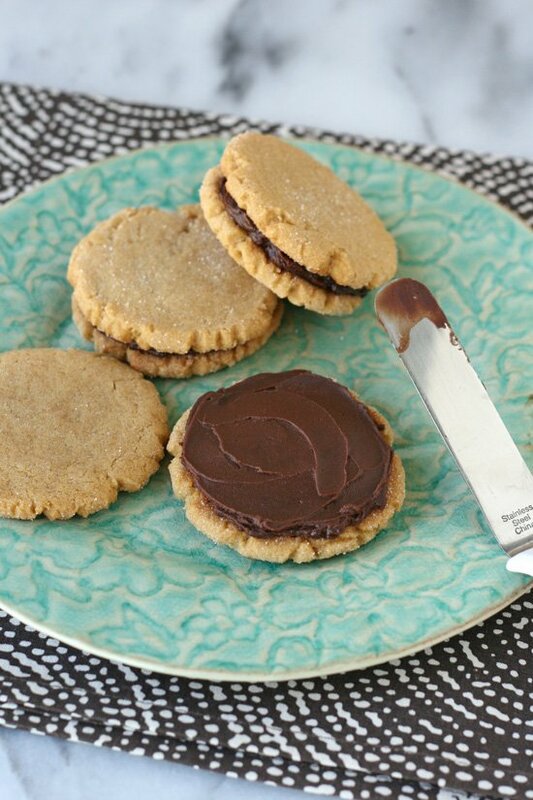 Peanut butter and chocolate just seem to belong together! 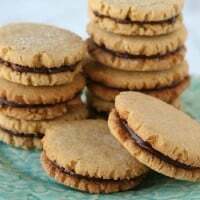 This classic combo is celebrated in these delicious Peanut Butter Cookies with Chocolate Filling. 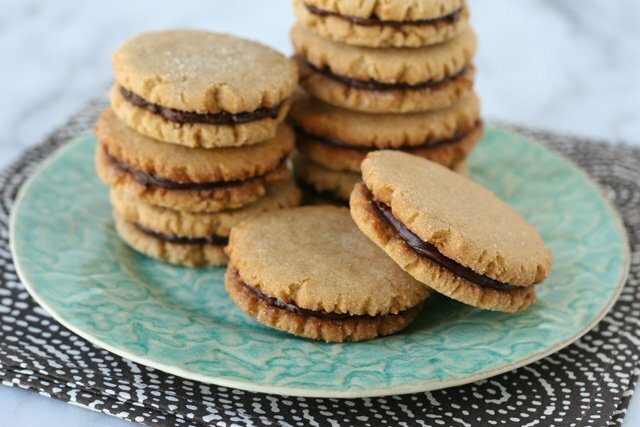 The peanut butter cookies are delicious on their own, but the additional of chocolate filling makes them extra special! And anytime I can eat two cookies and call it one, I’m pretty happy with that math! This recipe is simply a variation of my Chewy Peanut Butter Cookie recipe. For these sandwich cookies I like to make the cookies nice and thin and bake them until they are a bit crisp on the edges. The finished cookies are rich, flavorful and sure to satisfy any peanut butter and chocolate fan! 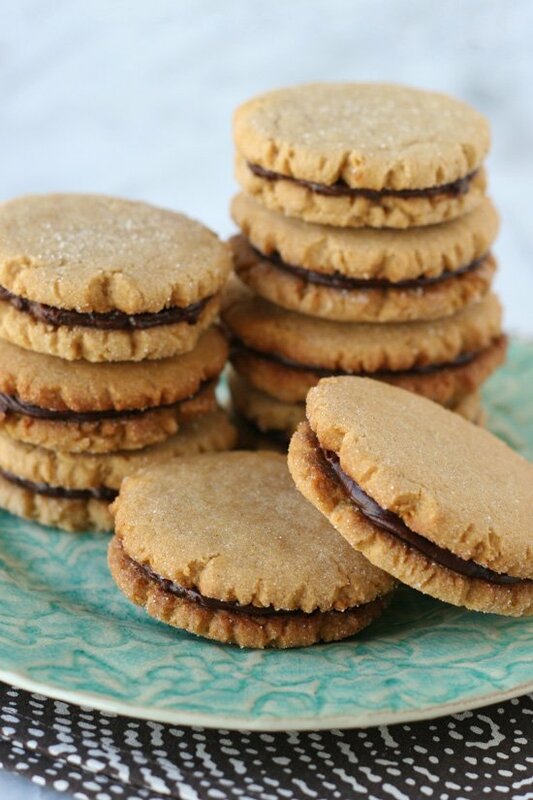 Classic peanut butter cookies with a delicious chocolate ganache filling. In a medium sized bowl, add flour, baking soda and salt. Whisk together, then set aside. In the bowl of an electric mixer, blend softened butter, peanut butter and honey. Add brown sugar and (white) sugar and continue to blend. Add eggs, one at a time, then vanilla and beat all ingredients until well incorporated. While mixing, slowly add the bowl of flour. Blend just until all the flour is incorporated. If the dough is very soft, chill dough (in the fridge) about 15 minutes. Preheat oven to 350*F and line baking sheets with a Silpat liner (this is what I used) or parchment paper. Using a 1 tablespoon sized scoop, scoop dough, then roll in your hands slightly to form a ball. Drop balls of dough into a small bowl of sugar, and roll to coat. Place balls of dough on the prepared baking sheet, then flatten to about 1/3" tall using the bottom of a glass. Bake cookies for 7-9 minutes. Remove from oven when the edges appear baked, but the centers appear slightly underdone. The cookies will continue to bake on the baking sheet as they cool. Cool 1-2 minutes on the baking sheet, then carefully move to a cooling rack. Measure chocolate chips and place in a medium sized bowl. 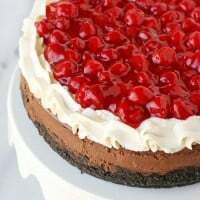 Heat heavy cream in a microwave until very hot, but not boiling. 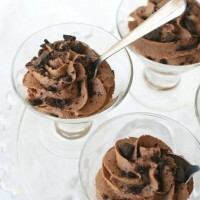 Pour hot cream over chocolate chips, and allow to sit (without stirring) about one minute. Stir slightly, just making sure all the chocolate chips are submerged in the cream, then allow to sit another minute or two until the chocolate is nearly melted. Stir as needed until the chocolate and cream are fully combined and smooth. Place chocolate mixture in the fridge and cool until thick enough to spread. Check and stir slightly every 10 minutes or so until desired consistency is reached. Use an offset spatula to spread the filling onto the bottom side of a cookie, then top with another cookie. I opted to make small cookies (about 2 inch diameter) but feel free to make any size cookies you wish. You will need to adjust the baking time based on the size and thickness of your cookies. Love peanut butter and chocolate together? 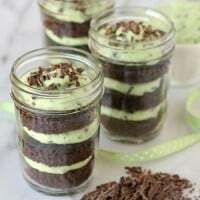 Peanut Butter Mousse with Chocolate Cookie Crumble, a favorite from my book, Glorious Layered Desserts, shared by The Little Kitchen. It can’t just be me hearing that voice saying . . . These. MUST. be. made! Can it? ? ? Oh, my . . . peanut butter and chocolate were definitely a match made in heaven! 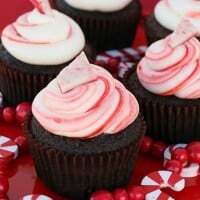 And these look yum! ! ! I’m not a big honey lover. Can these be made by omitting the honey and increasing the amount of brown sugar to 1 cup?? On another note, please seriously consider changing the size and color of the comment section and links throughout the site. The tiny font and pale blue color are *very* difficult to see. Thank you! Hi Deborah, Yes, I’m sure it would work well to replace the honey with brown sugar. The honey helps keep the cookies a bit soft longer, but I’m sure they’d be perfectly delicious without it. your blog and book are such an inspiration!